An inner-city haven with warm and friendly ambience. Our bed and breakfast in Nelson, New Zealand, Cambria House, is a gracious colonial homestead with modern facilities combining style, luxury and excellent service. We have six individually furnished rooms (all with ensuites), private guest lounge, a large sunny deck and secluded woodland gardens, ideal for relaxing in with a coffee or glass of Nelson wine. We provide free internet access on our dedicated guest PC, or free broadband wireless if you are travelling with your laptop. We also provide off-street parking and if required, secure storage for your luggage while you are walking in the Abel Tasman National Park. Click on the Trip Advisor logo on this page and see what our previous guests have to say. 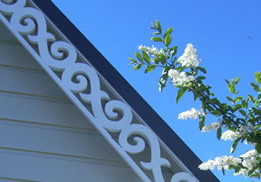 Cambria House is a beautifully restored Victorian villa, ideally suited for overseas or New Zealand travelers on holiday, small groups of friends getting together, or business people wanting to stay in the comfort and quiet of a bed and breakfast facility. It is situated in the inner city, in a quiet street only five minutes walk from centre of Nelson, a place renowned for its arts and crafts, excellent cafés and restaurants. Come to Nelson; it is a gourmet's delight! Your base to enjoy the splendour of the region. Karel and David are New Zealand born and have an extensive knowledge of NZ tourism. In fact Karel is a sixth generation Nelsonian; David was born in Southland. We are both proud to introduce to you the sunshine city of Nelson and its environs. We will provide you with excellent accommodation as well as information and advice on sightseeing and activities in this province. The Nelson area is truly beautiful and diverse with its three national parks, golden sand beaches, rivers for swimming and fishing, wineries, breweries, artists and craftspeople, golf courses and great restaurants and cafés. 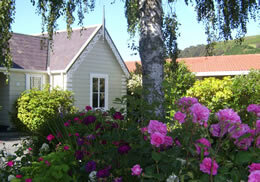 Our guests often wish they had planned to have more time in Nelson. You can plan it that way now! A good life is made up of fine moments... there are many here for you to enjoy. We look forward to meeting you and sharing with you our spacious and tranquil heritage home in Nelson, the iconic sunshine city of New Zealand. Check out your dates on "Availability" and make a booking now! short break with Cambria House. Cambria House: 7 Cambria Street, Nelson, New Zealand.